With the right techniques, you will make flies that match the tiniest insects on the water. 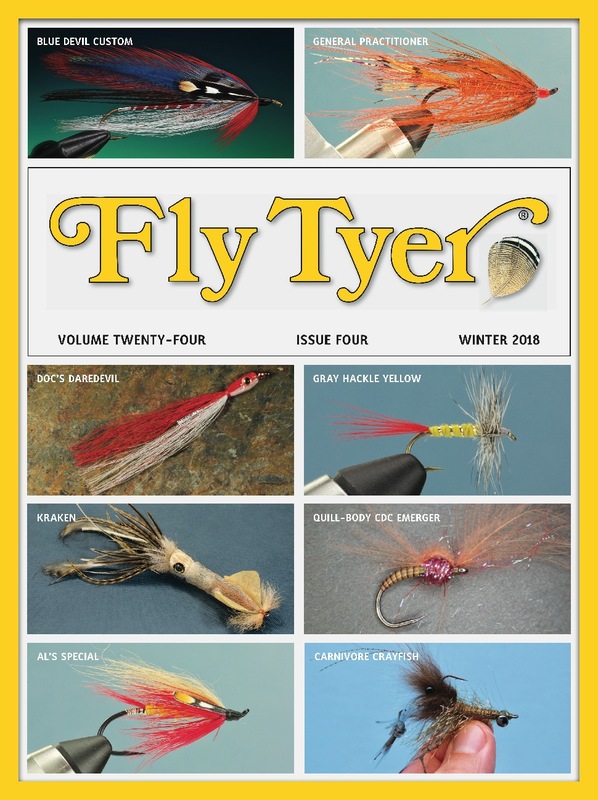 MAKING SMALL FLIES—say size 20 and smaller—is intimidating for tiers of almost all skill levels. There are some tips and tricks, however, that make doing this easier. Hook: Regular dry fly hook, sizes 22 to 18. Thread: Black Veevus 16/0 or another brand of extra-fine thread. Tail: Coq de Leon or other mottled hackle fibers. Wing post: Polypropylene yarn or your favorite wing post material. First, you can’t tie what you cannot see, and the better you can see, the better you will tie. Unless you have extraordinary eyesight, you might need some type of magnification in order to tie nice small flies. I prefer wearing glasses—readers or cheaters, whatever you prefer calling them—as opposed to peering through a big lens suspended above the fly. Purchasing a selection of inexpensive reading glasses in a range of magnifications is the easiest way to determine which pair will work best for you; this experiment will cost no more than a few dollars, and it is money well spent. Place a size 22 or 20 hook in your vise, and try each pair of glasses until you find the one that puts the hook in the sharpest focus and places you a comfortable working distance from the vise. Make a note of the magnification, and head to the local drugstore to get a better quality pair of glasses in the same power. You might end up using your new glasses for all your tying. Having plenty of good-quality light is also essential for tying flies, especially small patterns. Modern LED, daylight-balanced lamps are usually bright, throw off almost no heat, are somewhat diffuse so they don’t cast harsh shadows, and aren’t too expensive. Purchasing a good lamp for your tying bench is a terrific investment. Another tip—unfortunately one that usually falls on deaf ears—is to scrub your hands with soap, warm water, and maybe even a nail brush before tying. This practice definitely helps with fingertip sensitivity, and it keeps dirt and natural oils from transferring to delicate tying materials. Try it once, and I think you’ll agree. Using high-quality, thin-diameter thread, such as Veevus 16/0, makes all the difference when tying small flies. It and similar fine threads are strong, grip well, and because they are so thin, they don’t build up bulk on the hook; avoiding excess bulk is especially critical when making small flies. And in terms of tying technique, don’t use too many thread wraps. You’ll be surprised how few wraps are actually needed to firmly secure materials to a hook. Get accustomed to using minuscule amounts of material, particularly dubbing. If the tying instructions say to just “color” the thread with dubbing, they mean it! Sometimes you can secure materials to the hook using a small drop of superglue or light-cured resin instead of thread wraps. In the video that accompanies this article, titled Tying a Parachute Adams in Size 22, I post up the parachute wing using light-cured resin. Also, rather than tying off the parachute hackle, I tie it in place with a drop of resin. This technique makes tying easier, and making fewer thread wraps offsets any additional weight from the adhesive. Use the tips in the accompanying tying instructions and the companion video to make a flotilla of diminutive dry flies. Tim Flagler is a master angler and fly tying instructor. He offers some of the very best fly tying instructional videos you will ever see at his website, www.practicalpatterns.com. Tim lives in New Jersey.